With the raise of smartphones, QR codes are becoming quite ubiquitous now a days. We see them everywhere - on newspaper ads, on packaging of food items etc. However most of the usage of QR codes remains the same - to share a web link that users can scan with their phone and visit. Google has recently introduced a very interesting application of QR codes that takes it beyond just a simple link sharing means. By using QR codes, they have eliminated the need to enter password and username, as long as you have a smartphone, in case you are on a public computer. On that screen a QR code is displayed. The QR code expires after some time. The user scans the QR code on the computer screen with his smartphone and opens the link on the phone's browser. 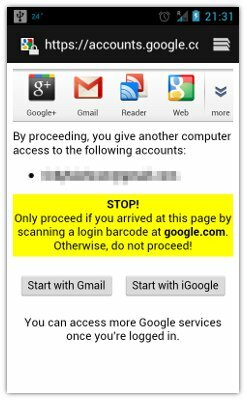 If the user is not logged into Google with the phone's browser, it will ask him to login. After logging in, it will give you a warning and gives you the option to open Gmail or iGoogle. If the user picks either Gmail or iGoogle, he will be logged in to Google and the page with the QR code will be redirected to his choice. If the user does not pick any and backs out, nothing happens. Of course this is much more complicated than simply entering the password. But the advantage of this is that you enter your username and password on a device you trust (your phone) not on a public machine.